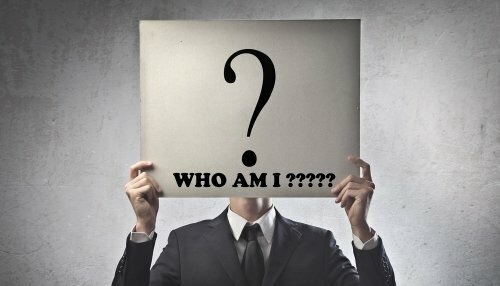 1 Peter Part 6 – Sermon Notes – Who am I? That is a question everyone wrestles with at one time or another. Sometimes, we wrestle with it more than once in life. That is because we gain our identity mainly through relationships. And all relationships, for better or for worse, change. A black line has no self-identity if it is on black paper. It needs some sort of contrast to take on its own shape and dimensions. Our identity is formed though the way we see ourselves in relation to other things and people that are NOT us in every way. So from the very beginning of this letter, Peter has been helping his disorientated readers who were involuntarily forced into a new and hostile culture – to find themselves again, after being wrenched from the contexts – at least partially by which – they understood who they were. No one knows this process of disorientation better than one who has lost a spouse or their parents or a child. Something of their self-identity is ripped from them. And the process of getting steady again can take a long time. It’s also the trauma of those who have suddenly lost their jobs after being in the same employ for a long time, or losing a faculty like sight, or hearing, or a limb. So that if our identity does not rest in things which cannot be changed under any circumstances, then every time circumstances DO change – we are lost – at least for a season. This is as much true for Christians as it is anyone else. This is common to the human condition. We were created with a certain relationship to God and this material world, and to one another, which in the Fall was radically and irreparably distorted. No wonder so many around us feel so “lost” and at times seem to spin off into strange behaviors trying to “find ourselves” as the saying goes. Man who was created in the image of God, to have fellowship with Him and to be His representative in the earth stripped himself of those identifying referents, and has been trying to redefine himself ever since. Proof of this is the total confusion that reigns in our society today, as so many, sadly and grotesquely try to gain a sense of identity in their sexuality (a concept never seen prior to Freud), or in fame, social standing, ethnic culture, material possession or career. And it all rings so horribly and shatteringly hollow. In the portion before us this morning, Peter is putting into the place the final piece of the Christian Believer’s self-identity. He’s been building this picture for us up until now a number of different ways. Not just ELECT as God’s people – tho certainly not less than that. And not just EXILES, though they are certainly that as well – according to their outward circumstances. And both, through God’s sovereign appointment. Both as part and parcel of their sanctification or setting apart for God and His purposes by the Holy Spirit. Both as part of growing in obedience to Jesus Christ. And both as part of their being purified from their sin through the blood of Jesus. An identity that ties their inward reality in Christ with their adverse, external circumstances. These are not in conflict, but by God’s sovereign grace, part of a unified whole. Next he led them to identify themselves NOT as hopeless, but as born again – to a LIVING HOPE through the resurrection of Jesus from the dead. As those in pursuit of holiness above everything else because that is where Christ is taking us – re-conformity to His own character. Living awestruck at the astounding salvation that is theirs in Christ – something even the angels wish they could comprehend fully. Ransomed from sin TO God, with the very blood of the Lamb of God! As overflowing with God’s great, divine love poured out through them – to others in Christ. Lastly, as “newborn infants” – born again by the Spirit of God – as those who have tasted the goodness of God – and being given the privilege of continuing to slake our soul’s thirst on that bottomless well. All of these are how Peter’s readers, and Christians in all generations are to begin to understand who they really are in this world. The sum of that identity being this: I belong to God in Jesus Christ, as one of His own children, infinitely beloved, and set where and when I am, for His good, eternal and wondrous purposes, until I gain my final inheritance. But he isn’t done yet. Peter has saved the best for last. He is about to summarize our true identity in Christ in the verses before us today. And from this platform, he will begin to tease out all the ramifications of what that means in the way we live here and now in the balance of the letter. So our task today is to see this summary in its fullness. Note how He gives a sort of summary statement before He examines things in more detail: 1 Peter 2:4–5 As you come to him, a living stone rejected by men but in the sight of God chosen and precious, you yourselves like living stones are being built up as a spiritual house, to be a holy priesthood, to offer spiritual sacrifices acceptable to God through Jesus Christ. Who is Christ as “The Cornerstone”? The foundation of All God is doing. What relationship to that do I have? I too am a living stone. What does all that imply? The Believer’s identity as a Priest of the Most High God. So first there is this word of encouragement: [[vss. 4-5]] Jesus was a living stone in relationship to God, but rejected in relationship to mankind. Especially by the Jewish religious establishment. Jesus knows the tension of the Believer in this unbelieving world. He knew Himself as the foundation of all of God’s purposes, and He knew what it was to have no one really understand that, and reject Him in the process. To treat Him as utterly worthless. A nobody. So you too – are chosen by God as central to His purposes, but will be regarded as nobodies by an unbelieving world. DO NOT BE SHOCKED BY ALL OF THIS. You are so tied to Christ in your salvation, that you become a further example to the world of what He was and is. Thus you share some of the same experience He had. [[ 6 ]] He cites Isa. 28:16 – Which speaks directly to God’s sending Jesus as “the Cornerstone” of His eternal purposes. A portion of which describes how He will be unrecognized as such, but that those who trust in Him will NOT be put to shame. [[ 7 ]] Psalm 118:22 – This rejected Stone of Jesus will become in due course, manifestly the Cornerstone to all. [[ 8 ]] Isa. 8:14 – But those who reject Him as such, will stumble over Him and be destroyed. Everyone who rejects God’s Word – especially as it reveals and relates to Jesus Christ – is destined to be rejected by God. NO ONE WHO REJECTS JESUS CHRIST IS ACCEPTED BY GOD. And note that Peter DOES NOT in any way insert himself in these passages as “the Cornerstone” of God’s work in and through the Church. This is all about Jesus, as Peter no doubt remembers that Jesus applied these STONE passages to Himself in Matt. Mark & Luke. In fact all 7 NT passages having to do with the OT image of this STONE are applied to Jesus and no one else. So – in light of all of this – who are you Christian in this world? Who were Peter’s readers in their extreme distress as exiles in a hostile culture? Who are Believers today in our increasingly hostile culture? No matter how hostile it becomes! Our identity remains the same. An identity – he is going to sum up in 3 concepts, 3 which all humanity uses, but uses without the light of divine revelation. 1. RACE – People, Stock, Family. 1 Peter 2:9 But you are a chosen race, a royal priesthood, a holy nation, a people for his own possession, that you may proclaim the excellencies of him who called you out of darkness into his marvelous light. [[ SLIDE ]] There is perhaps no identifier more profound than this one. We live in a day when people identify themselves – even as Americans, while referring to their ethnic or racial background as first. So we have Ibero-Americans, African Americans, Irish-Americans, German Americans, etc. There is nothing wrong with this in and of itself. It is very natural – to want to be connected with those we would call our “people”, the stock we come from, our ancestry and family. White, Black, Asian, Hispanic, American Indian or Alaska Native, and Native Hawaiian or other Pacific Islander. The scientific community argues back and forth as to whether or not true racial categories really exist. After all, in the most basic sense – there is at the bottom of it all, simply, the race of man. Humankind. From that point, we have lots and lots of sub divisions. But it is at this most basic point that Peter is asking his readers and us, to consider Christians as both sharing a common humanity as having all sprung from Adam – but beyond that, to be a new race entirely. One without genetic or social or ethnic considerations. There is in God’s scheme of things but two races – Regenerate human beings, and unregenerate human beings. He bids us to consider, as the Greek word imports here – that our “People”, our “Stock”, our “Family” is the family of God. We were born into it when we were born again. And so radical is the change, when the Holy Spirit comes to indwell someone, it is to make them an entirely new class of human being. No, we do not entirely lose those other characteristics we share with the rest of humanity, but there is a new humanity in Christ. Paul deals with this issue very plainly when writing to the Ephesian Church where the issue of those who were racially or ethnically Jewish, had trouble relating to those where we NOT Jewish and Gentiles in the Church. So he writes: Ephesians 2:14–16 For he himself is our peace, who has made us both one and has broken down in his flesh the dividing wall of hostility 15 by abolishing the law of commandments expressed in ordinances, that he might create in himself one new man in place of the two, so making peace, 16 and might reconcile us both to God in one body through the cross, thereby killing the hostility. Jesus didn’t come to be “Jewish” savior, or a Gentile savior, He came to save lost human beings irrespective of race, and make them “one new man” – one new race or ethnicity altogether. “IN CHRIST” or “IN HIM” is the term employed in the NT well over 100 times. To think of ourselves in these terms is both sublime and overwhelming. We were not born again as Italian, or Hispanic, or as white or black or Asian or Pacific Islander – we were born again as Christians! As children of God! This is our racial heritage. And it is this we are to take to ourselves as our chief identity. Peter is interested in reliving his readers of the stress of trying to figure out how to assimilate and interact with their new cultural surroundings, by directing them to live first and foremost as Christians in their surroundings. To live in line with their true race, and stock and family. To think of themselves and live as Christians above all. By the Spirit of God he brings them to another self-identifier that will inform all they say and do. He asks them to consider their PURPOSE. 2. PURPOSE – 1 Peter 2:9 But you are a chosen race, a royal priesthood, a holy nation, a people for his own possession, that you may proclaim the excellencies of him who called you out of darkness into his marvelous light. Peter is aware that we take much of our self-understanding from what we DO in life. Career, job, activity, etc. Here he asks his readers to consider that before they are merchants, or housewives, or craftsmen or farmers or garment makers – that they are PRIESTS. Royal Priests. Ordained by God to the offering up of spiritual sacrifices. About the holy privilege of honoring God in all of His saving glory everywhere and at all times. Making His goodness and mercy and grace and lovingkindness and forgiveness and patience and holiness and all that is glorious in Him – known to others! And that, primarily by being the vessels these things are poured out of! Since all of the sin sacrifices have been fulfilled in Christ – there is only one kind left to us in our Priesthood – sacrifices of praise and thanksgiving. Proclaiming – making known the excellencies of the One who called us out of the darkness of this world, and into His marvelous light! 3. CITIZENSHIP – Sharing a common culture and tradition. 1 Peter 2:9 But you are a chosen race, a royal priesthood, a holy nation, a people for his own possession, that you may proclaim the excellencies of him who called you out of darkness into his marvelous light. What I want to suggest to you, on the basis of what the Holy Spirit has written here, is that we ought not to think of ourselves as Evangelical Americans, but as Christians first of all. And Americans in the sense of being resident aliens. “The term parepidēmos (plural, parepidēmoi) was used in the first century to designate someone who did not hold citizenship in the place where he resided and was therefore viewed as a foreigner. The lack of citizenship implied that such people did not enjoy all the rights and privileges of citizens. Moreover, as foreigners, they were not necessarily expected to hold the values and practice the customs of their host culture. Because of such differences, foreigners were often looked upon suspiciously as potentially subversive to the established social order, an attitude not unfamiliar even today. As Peter expects his 1st readers to take this idea in fully, so does the Holy Spirit expect us to! Christian before Roman or Galatian, or Pontian or Cappadocian or Asian or Bithynian in their case. Christian before American, or German, or Dutch or Irish or Italian or African or Tibetan in our case. And Christian before Republican or Democrat, Liberal or Conservative, Independent or Libertarian, Progressive or Socialist. This is absolutely foundational to our self-identity. We can be all those other things in the second place- but never first. Christian defines us over and against everything else. That is a paradigm shifting reality that few of us have ever truly considered, let alone lived conscious of. But I would challenge you today to begin to think in these terms. Terms that will radically transform the way you see yourself, and therefore in the way you live life in this present world and age. 1 Peter 2:9–10 But you are a chosen race, a royal priesthood, a holy nation, a people for his own possession, that you may proclaim the excellencies of him who called you out of darkness into his marvelous light. 10 Once you were not a people, but now you are God’s people; once you had not received mercy, but now you have received mercy. Be your own culture in the midst of the one that surrounds you. Own your RACE, your PURPOSE and your CITIZENSHIP. And let the rest fall where it may. Are you a Christian? Have you indeed been born again by the Spirit of Christ? Have you seen and owned and confessed your sin – running to Him for forgiveness, and trusting only in the shed blood of Jesus Christ at Calvary for your right standing and acceptance with God? You can only be one of 2 races. That of Adam, or that of Christ Jesus. Jobes, Karen H. 2005. 1 Peter. (Baker Exegetical Commentary on the New Testament). Grand Rapids, MI: Baker Academic.